In 1985, gay rights activist Cleve Jones (1954- ) had an idea. Worried that history would forget the thousands of people killed by AIDS he set about documenting their lives. The first version of the Quilt was a simple display of placards with names that Jones arranged on the walls of the San Francisco Federal Building during a candlelight march. It was after this march in 1987 that Jones teamed up with Mike Smith and several others to formally organize the NAMES Project Foundation. People in the U.S. cities most affected by AIDS — Atlanta, New York, Los Angeles and San Francisco — sent panels to the San Francisco workshop. The first inaugural display of the Quilt was on October 11, 1987, at the National Mall in Washington D.C. during the National March on Washington for Lesbian and Gay Rights. It covered a space larger than a football field and included 1,920 panels. Half a million people visited the Quilt that weekend. Afterwards, the Quilt went on a 20 city national tour; in each city, panels were added on by locals. At the tours end, an additional 6000 panels had been added. The Quilt has been on display several times since 1987, with the last showing in Washington D.C., 1996 (pictured below). At that time the Quilt covered the entire National Mall. The Quilt remains the largest community art project in the world. 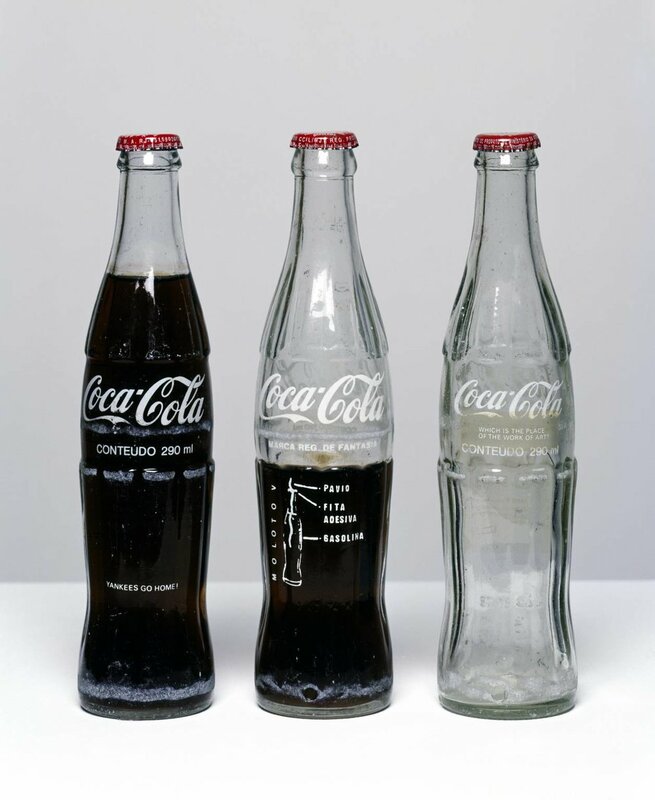 "When Brazilian artist Cildo Meireles (1948- ) produced his Insertions into Ideological Circuits: Coca-Cola Project, 1970, in Rio de Janeiro, he was looking for a form that could both capture the experience of life under dictatorship and push back against its oppressive constraints. Meireles designed Insertions into Ideological Circuits: Coca-Cola Project to maximize effect while minimizing his own risk of being identified; the work consisted in altering reusable Coca-Cola bottles by adding questions, slogans or illustrations in a white font that mimicked the bottle’s brand inscriptions. Two examples of these bottles are pictured below, each with a different furtive missive. The bottle on the left bears the phrase, ‘Yankees go home!’; the one on the right, a labeled diagram of a Molotov cocktail. Despite the dramatic provocations offered, these modifications are subtle – practically invisible when the bottle is empty; then legible when filled. Meireles created over 1,000 such bottles, releasing them back into circulation to be passed between untold numbers of people along the circular route between the Coca-Cola bottling plant and the marketplace. Meireles devised this circulating artwork because of the political climate in which he was working - a military dictatorship in Brazil. Artists living under this constant threat of violent censorship – but without even the dubious benefit of specific guidelines as to what would and would not be tolerated by the military regime – had to develop new strategies for making socially significant art. For Meireles, this meant putting the work of art quite literally in the audience’s hands." Text taken from Jonah Westerman's piece on Cildo Meireles for Performance at Tate: Into the Space of Art. "Where's that smile?" A phrase myself and many other women have heard should they dare look unhappy. 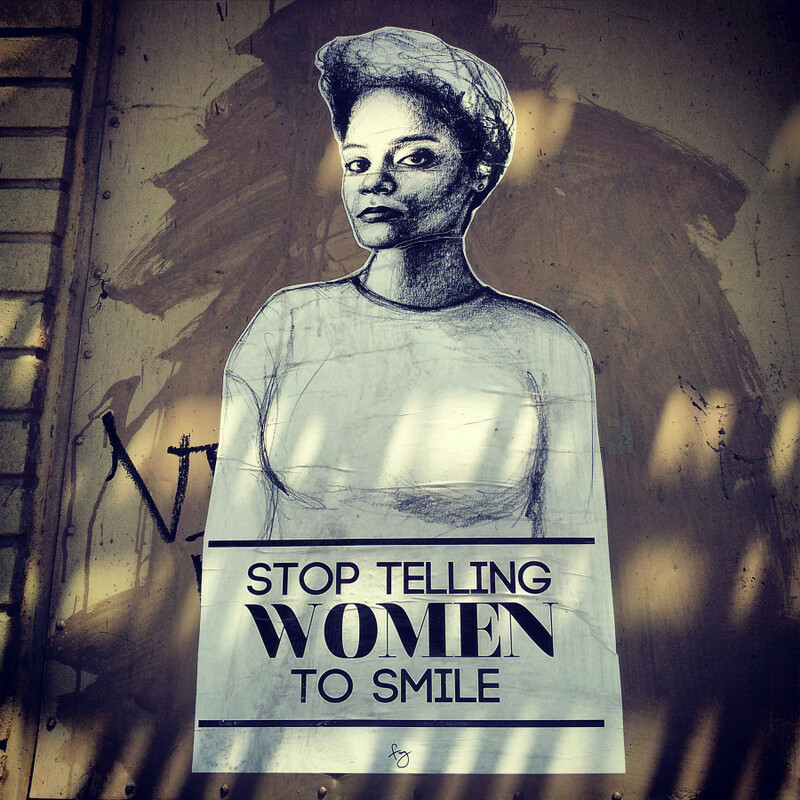 One thing that connects women all over the world is the shared experience of street harassment. 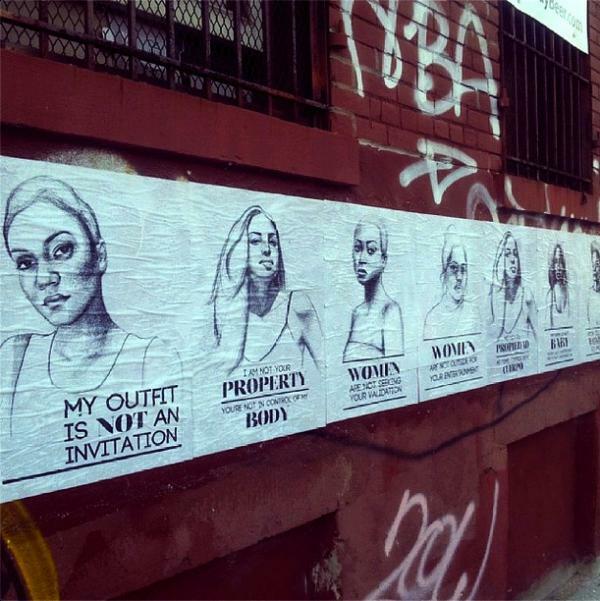 Tatyana Fazlalizadeh (1985- ), an illustrator/painter based in Brooklyn, decided to take the stories of women back to the streets to address the treatment they receive there. The STWTS website states, "This project takes women’s voices, and faces, and puts them in the street - creating a bold presence for women in an environment where they are so often made to feel uncomfortable and unsafe." 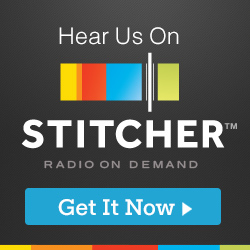 The series has traveled around the world, allowing women to speak directly to their offenders from New York to Mexico City to Paris. There are artists who make a work of art to protest an injustice they see, and then there are artists who make their life's work one giant protest. Ai Weiwei (1957- ) is the latter. From the 100 million Sunflower Seeds in the Tate Turbine Hall to his Instagram posts before, during, and after being obtained and beaten by the Chinese government, Ai Weiwei has never shied away from making a political statement. His artwork address corruption and censorship by the Chinese government and international crisises - like the Syrian Refugee crisis in 2016. The images below are just a few examples of lifelong commitment as a dissident. Installed 14,000 life vests around the columns of the Konzerthaus Berlin concert hall after he witnessed the Syrian refugees arriving in Lesbos. The installation was intended not only to call attention to the crisis but also to serve as a tribute to the individuals who died during the passage. Ai Weiwei created this photograph after seeing an image of a drowned 3 year old Syrian boy on the shores of Turkey. A work from Ai Weiwei’s Study in Perspective series, taken between 1995 and 2003. The artist travels around the world flipping the bird to different symbols of power. Ai Weiwei installed this installation of 100 million Sunflower Seeds in the Turbine Hall at the Tate Modern. Commissioned for the Unilever Series, the installation invites visitors to walk over the porcelain pieces, which cover 1000 square meters of the hall. The goal of the piece is to comment on the mass production and consumption that has consumed Chinese culture and other first world countries. Ai Weiwei, He Xie, 2010, 32000 porcelain crabs. In He Xie, Ai metaphorically represents the restriction of individual expression and freedom of speech in Chinese society. He xie, literally “river crab,” also sounds like the word for “harmonious,” which is part of the Chinese Communist Party slogan “The realization of a harmonious society.” He xie has thus come to refer to online censorship and the restriction of individual freedom of expression in Chinese society. In November 2010, Chinese authorities announced that Ai’s new studio in Shanghai would be demolished. In response, Ai invited guests via Twitter to a feast of ten thousand river crabs to protest the government’s control of information. Placed under house arrest for his actions, he was unable to attend his own feast. Fritz Scholder (1937-2005) was one of the first Native artists to find mainstream success while flat out rejecting our culture's expected representation of Native Americans. Scholder’s explored ideas of representation, misrepresentation, and stereotype along the way. At the height of his career in the 1970s, the American Indian Movement mirrored the growing tensions in the Civil Rights Movement. Activists pushed for Indian sovereignty and addressed issues of racism and federal policies that discriminated against Native populations. Though Scholder never formally aligned himself with an activist organization, the image Indian Power (below left) became a popular poster among Native Americans in the 1970s. His work does not shy away from addressing the dark (often ignored) history of America. Several of his pieces (below middle & right) reference the massacre at Wounded Knee in 1890. Mangled bodies with raw flesh exposed tell the tale of troops from the US 7th Cavalry Regiment slaughtering an estimated 300 Lakota. The site of Wounded Knee made history again almost 100 years later during the American Indian Movement occupation in 1973, just a year after Scholder painted these pictures. The paintings are still incredibly relevant today, as several tribal reservations are threatened by energy extraction and police violence against Native Americans increases.